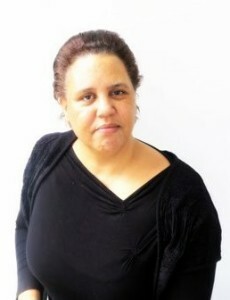 Angela Lawrence, Executive Director of Manchester Active Voices has been awarded an MBE. The Manchester Evening News reports that ‘Angela Lawrence was at the forefront of the Moss Side community’s response to escalating gun crime in the 1990s. After several young men and women lost their lives as a result of gang warfare in the area she decided to help set up campaign group Mother’s Against Violence 10 years ago. The organisation helped raise the aspirations of hundreds of teenagers in the area, offering peer mentoring, counselling and support to young families affected by violence. In 2009 she took her personal commitment further and set up a charity on her own called Manchester Active Voices. Ms Lawrence said: “In the 90s there were lots of shootings, lots of killings. She said she felt ‘overwhelmed’ to be receiving the MBE and it was totally unexpected. The mother-of-three said: “I was really emotional. 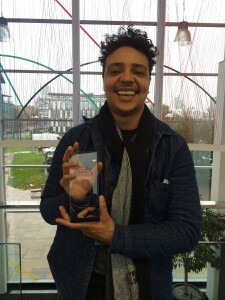 Trent Taylor, a Peer Mentor with Manchester Active Voices, has been awarded ‘Most Inspirational Mentor of 2015’ at the Kids Count Inspiration Awards in London. Trent has been recognised for his work supporting young people with their life in and out of school. One of Trent’s young mentees said “Since I have had a mentor…I get more support, I don’t argue with my mum all the time, everything is easier”. Speaking about his award Trent said “I feel honoured and I feel proud, and that the work I have been doing has been recognised, which is a good thing”. A proud and happy Trent Taylor with his award. Well done Trent, we’re all very proud of you!!! We are proud that we have made the shortlist to the 2014 Women in Housing Awards! “One of The Gang? : I Define Me” by Manchester Active Voices. Films made by young people at Manchester Active Voices about being involved with a gangs. Congratulations must be given to Co-Director Gabrielle Samuel. Future leader magazine annual award ceremony saw Gabrielle receive the honour of being named ‘Number 1 graduate of 2012‘!! Future leaders magazine documents the successes and achievements of top 100 black undergraduates and graduates throughout the UK. Future leaders held their 4th annual ceremony at Mercers hall, London, and witnessed the top acclamation going to to one of Manchester Active Voices Directors, we should also note the first female to receive the award. Again, congratulations Gabrielle, we couldn’t be more proud of you. To read the magazine online…. Manchester Active Voices Youth Empowerment Programme successfully secured Home office Funding to run their bespoke S.E.N.S.E. Programme. The S.E.N.S.E. (self esteem ‘n’ Self empowerment) programme will cover 10 modules aimed to increase self confidence and empowerment, thus enabling girls to “make safe choices”. We believe that ensuring a safe environment with experienced staff/volunteers will enable Girls / young women to work collectively to explore the issues that they face and develop learning tools and resources which can play a large part of their learning towards empowerment, and the value of self. Young women will be given the opportunity to engage in a learning process which will increase their confidence and potential in acquiring further skills for employment. Alongside the opportunity to think of themselves as partners and stakeholders in their communities and wider society.